Lightly grease an 8½ x 4½” metal loaf pan; set aside. Mix fresh herbs with butter or margarine; set aside. Divide thawed loaf into 8 equal size pieces. Dip each piece in melted butter and herb mixture. Place in loaf pan. Let dough rise until double in size. Bake in a preheated 375° oven for 20 minutes. Remove from oven and pan to cool on wire rack. 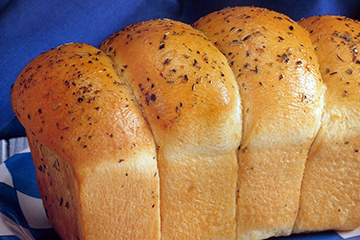 For mini loaves, use mini loaf pans that measure 5-7/8 x 3¾ x 2¼”. Place 3-4 pieces of prepared dough in each pan. Let rise and bake as directed above for 15 minutes. Brush with remaining butter. Remove from pans to cool on wire rack.